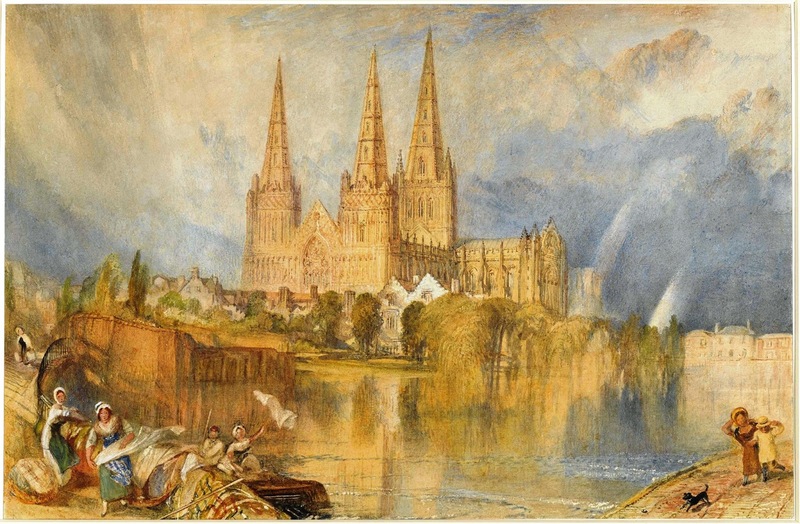 The timing of my visit to Lichfield last week meant I missed yesterday’s opening of the exhibition ‘Mr Turner Comes to Lichfield.’ This exciting exhibition, celebrating the works of the painter JMW Turner (1775-1851), continues in Lichfield Cathedral until 11 June. This is a rare opportunity to see Turner’s watercolour of Lichfield Cathedral, which he painted in 1832 and which is the centrepiece of this exhibition. Until recently, this painting was in a private collection, and it is now on public display for the first time in many years. Alongside it are Turner’s sketches for the painting, loaned by Tate Britain. In all, there are five works by Turner on exhibit. Other artists whose work is included in the exhibition include the brothers Samuel and Nathaniel Buck, John Glover, John Buckler, John Louis Petit, John Piper, who also designed the East Window in the Chapel of Saint John’s Hospital, Lichfield, Peter Walker, who is the Artist-in-Residence in Lichfield Cathedral and curator of this exhibition, and two winning entries in last year’s art and photography exhibition at Lichfield, Carl Knibb and Dawn Futton. The beautifully-produced catalogue that accompanies this exhibition includes reproductions and descriptions of each of the 22 works on display and of the artists. The English landscape artist and illustrator John Fulleylove (1845-1908) was born in Leicester and originally trained as an architect before becoming an artist in watercolour and oils. His painting in this exhibition, ‘Dr Samuel Johnson visits Lichfield,’ dates from 1891, and is a work in oil on canvas, measuring 745 x 700 mm. This is one of nine works in the exhibition on loan from the Samuel Johnson Birthplace Museum in Lichfield. Samuel Johnson (1709-1784) was born in the house that now houses this museum, within sight of the three spires of Lichfield Cathedral. It was his family home, and he was born above his father’s bookshop on the corner of Breadmarket Street and the Market Square, opposite Saint Mary’s, the guild and civic parish church of Lichfield. His immediate family members are all buried in Saint Michael’s Church. 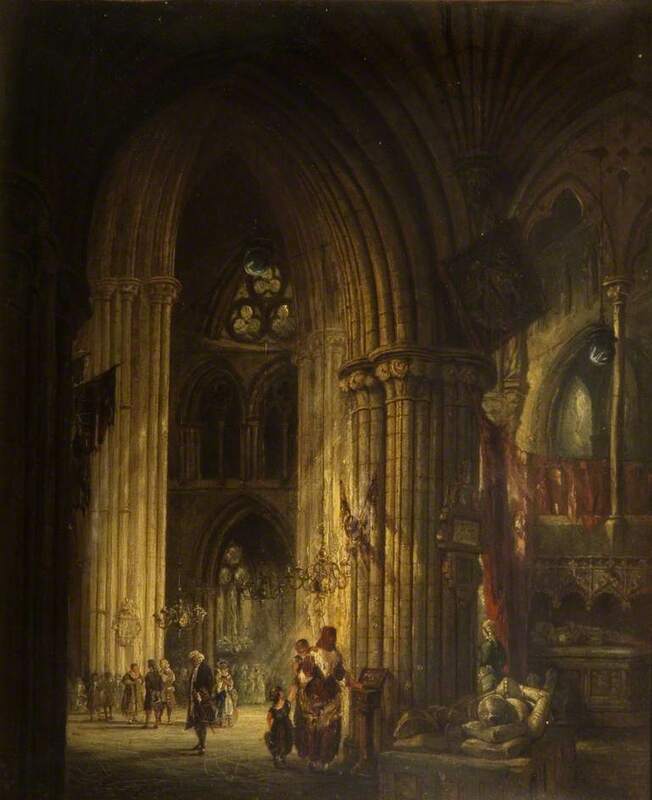 Although Johnson loved Lichfield Cathedral, there are few references to him worshipping there. As a child, he visited the cathedral with his father to hear the controversial High Church preacher and theologian Henry Sacheverell. Later, as an adult, Johnson borrowed books from the cathedral library. 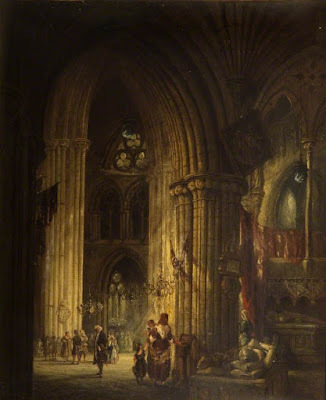 As an architect, Fulleylove was interested in the architectural details of Lichfield Cathedral, and this interest is borne out in this painting. The principal monument to Samuel Johnson in Lichfield faces his birthplace. But there are other monuments to him in Lichfield Cathedral, which I looked at last week. One is a statue on the exterior choir, close to similar statues of Brian Walton (1600-1661), the priest, divine and scholar who compiled the Polyglot Bible, the architect Sir Christopher Wren (1632-1723), holding a model of Saint Paul’s Cathedral, London, and the Lichfield-born antiquarian and herald Elias Ashmole (1617-1692), who was born 400 years ago and is the subject of an exhibition in Lichfield Cathedral, later this year, ‘Discovering Elias Ashmole,’ from 19 October 2017 to 18 February 2018.
a distinguished moral writer, and a sincere Christian. He died the 13th of December, 1784, aged 75 years. and impoverished the public stock of harmless pleasure. 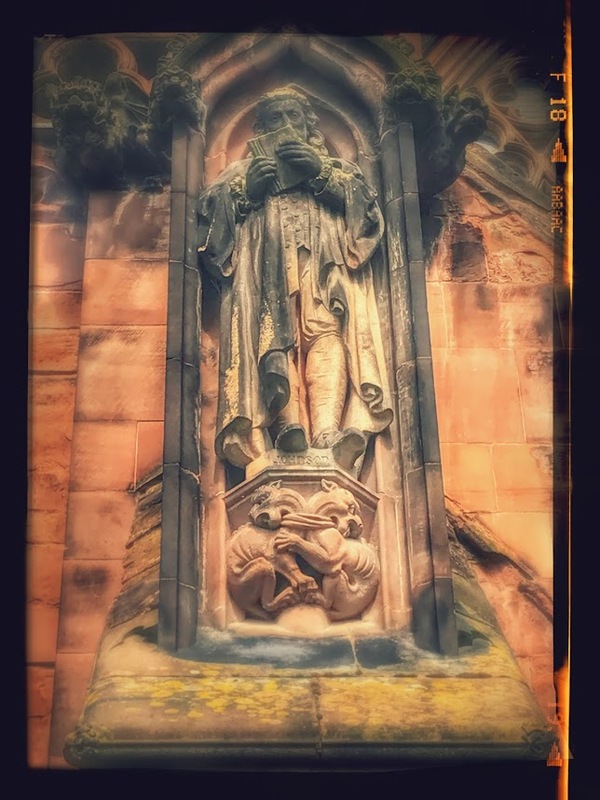 Garrick’s monument in Lichfield Cathedral was designed by the architect James Wyatt (1746-1813), who was born in Weeford, a small village south of Lichfield that I also visited last week. Interestingly, at an early stage in his life, Turner also worked for Wyatt and originally considered a career as an architect.